After long thoughts on how to build stronger connections with our customers, educate them on signs and give them a better sign purchasing experience, we came to an idea – to make a showroom. A Showroom is a space used to showcase all products a company offers – be it clothes, cars or books. 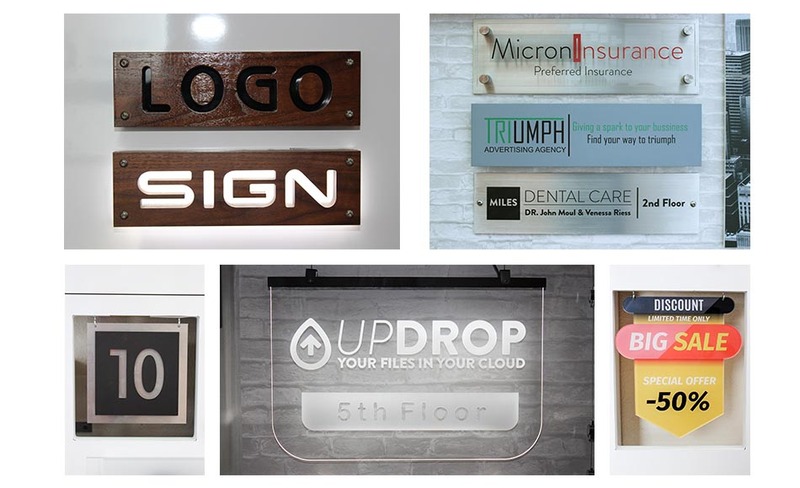 Front signs created its showroom to give its customers a better insight on its products and the materials they’re made of. Whether you want a sign for your business or personal use, we have everything for you. The new showroom is the FIRST and ONLY ONE in Van Nuys. It contains about 100 samples of signs of different types, sizes and shapes. The signs are presented in almost all possible variations and material combinations. 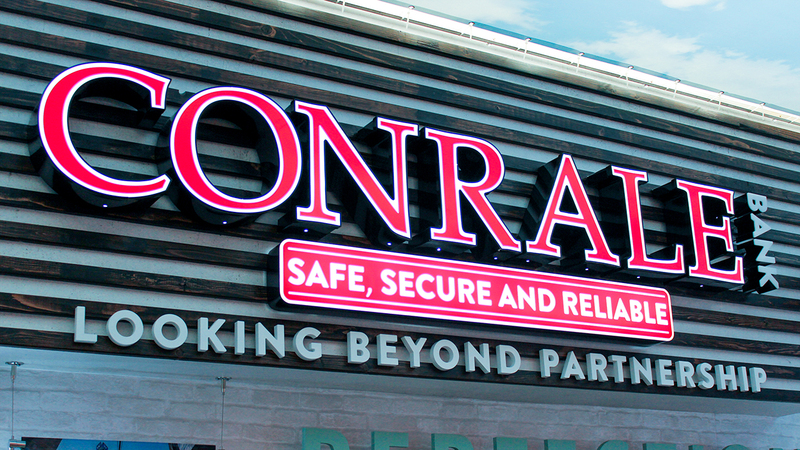 In this picture, you can see illuminated channel letters, a lightbox and non-illuminated channel letters looking from top to bottom. A modern Acrylic desk Organizer for offices. Keep your cards and stationery organized in one place. Stylish organizers can also be used for beauty salons, cosmetics stands and holders in stores and more. Order signs that will fit well with your product and company vision. A delicate combination of Aluminum and Black acrylic. Remember, that this is only a sample. For YOUR sign you can choose any other combination of materials, colors, letter fonts and sizes. Not having enough space for describing each and every sign I will advise you just to pay a visit to our showroom. Did you notice that key-shape sign? It’s one of the novelties in the real estate industry. You can never confuse it with another kind of sign, it speaks for itself. Channel letters are here, give them a look. Let’s see what each of this signs made of to help you make an easier decision in your further sign purchasing experience. 1. Wood can turn into stylish sign letters and not only. Sign plaques like the ones you can see in our showroom (and below in the picture) can be designed for a stylish wooden logo sign. See the elephant? Our CNC milling machine delicately engraved it with high precision. 2. If you like the way the sign “QUALITY” looks, you can get it made from Aluminum, PVC and Gatorboard. 3. In our showroom shown Reverse lit letters are made of aluminum and painted yellow. They are produced with aluminum faces and returns and aluminum backs ( can be acrylic for interior usages). Led lights are attached to them from back and the light fells on the wall. Notice that the letters are mounted away from the wall so a halo forms behind them. 4. “WINE” is made of ultraboard. It is a foam core with aluminum finishes. Ultra board is a perfect substitute for aluminum – it’s lighter and more affordable. It can also be printed on. 5. The letters “POKEACI” are made of aluminum and painted black. You can order letters from aluminum of different fonts, sizes and shapes. Laser cutting machine allows getting various shapes of letters. Photographers can have their artwork printed on acrylic for exhibitions or personal collection. Need an interesting home decor with a personal touch? Have your personal photos or a favorite artwork printed on acrylic, as well as Aluminum, Canvas or PVC. They give such a juicy touch to the interior design! Think of something more trendy? Wall picture clusters are the answer. Split your photo into parts and give it a more impressive and modern look! For this stylish work Acrylic, Aluminum and PVC can serve as materials. Sign plaques for offices, home numbers, sale announcements and what not. Options are unlimited, choose the one for your business. Imagine that it’s vinyl, printing on banner. Together with Stand structures they can advertise your product in trade shows, conferences. One of its types – Mesh banner – can even let wind pass through it (through the holes) making it hard for it to destroy the banner. A showroom is the only place you can touch and feel the materials, understand their structures, and see them combined as a whole – in the form of a sign. Here you will be in direct contact with professional specialists that can answer all your questions, give useful advice on sign design and material usage adjusting to your needs. Pay us a visit, we’ll be excited to show you around !! See the Press Release on the opening of our Show room at 24-7 Press Release.